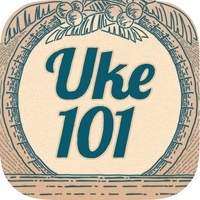 Aloha and welcome to the Uke101 app! The ukulele has a unique sound known throughout the entire world. It has an inspiring rich culture that stretches back more than a century. Perhaps you got your ukulele because you are inspired by Jake Shimabukuro, or you received it as a gift, or maybe because you’ve just always adored its sound. No matter what reason inspired you to pick it up in the first place, Uke101 can help you learn the uke and even master its sound! Everything you need to go from beginner to expert is here. We present lessons in a fun, colorful way straightforward and easy to learn with lots of sound samples, pictures and visual notation to help you out. 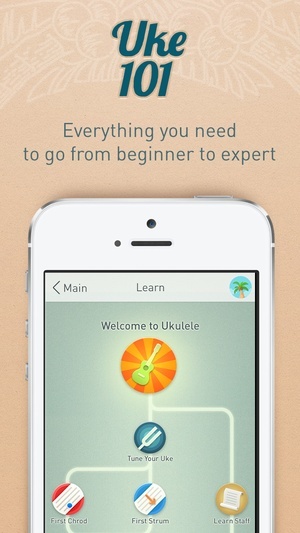 Uke101 has three parts Learn, Game and Tracks Start learning how to play the Uke from square one. Lessons are easy to understand even if you’ve never played a stringed instrument before. Uke101 will help you get going with 29 lessons covering the basics of ukulele history, sound, notation and tab reading, strumming technique, several types of useful rhythms, simple and advanced chords, and by the end the chance to play whole songs. 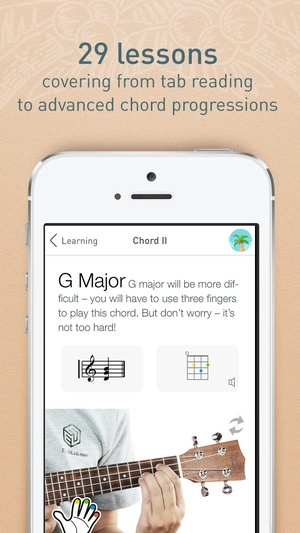 Every chord is shown with two pictures of hands on the fretboard. 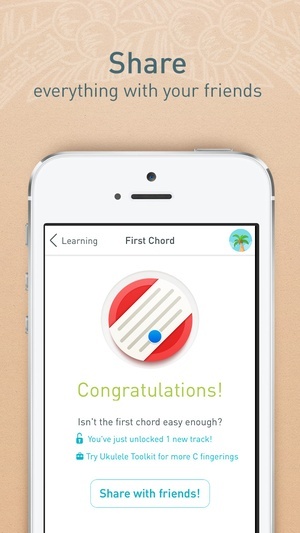 There are 9 quizzes to test your knowledge along the way and practice what you've learned. More advanced Uke players can skip the parts they already know, or use Learn to brush up on their technique. This is where the real fun starts. Practice the chords, different types of strumming, scales, and even the music theory you learned in the first mode through Uke101’s game interface. Grab stars along the way as you complete the challenges. Share the results with your friends as you complete sections. You’ll have so much fun you may not even realize you’re becoming a better player as you go! Learning and games are great, but ultimately you want to play familiar songs you know and love. That’s where the Tracks mode comes in. Play along with existing songs. You can even record your playing and share it on social media. You’ll be surprised at all the songs you can play on a Uke! We at EUMlab have fallen in love with the Ukulele if you’re reading this, you probably have too. So let Uke101 guide you through the basics and set you on a path to becoming the next Tiny Tim. Uke101 Highlights 29 Lessons Clear photos that teach chords using both front and top views Instructional videos included Circle of 5ths and chord progression charts Built in Mini Uke Tuner 4 Games for learning and memorizing chords, scales, strums and music theory 59 tracks for practicing and learning songs Fun colorful interface that keeps you coming back to learn more About EUMLab EUMLab helps you unleash your musical talent! With magic technology, EUMLab creates products that get you learning and playing music fast. Find out more about us EUMLab.com Follow us on Twitter/Facebook @EUMLab Questions? Write us feedback@eumlab.com Watch our videos bit.ly/eumvideo Thanks, everyone. 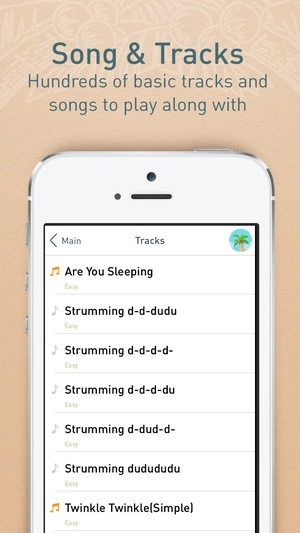 We will keep making the best music apps for you. Check these links to find your download for Uke101 for & iOS or for your device iPod TouchiPadiPhone. 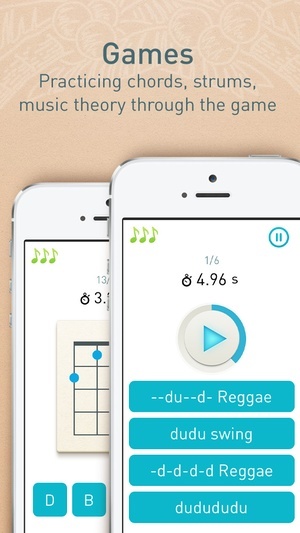 The app Uke101 is compatible with te following devices.